On Sunday, January 21, Chef Eric Hanson and his culinary team at Prairie Noodle Shop broke away from their ramen mould and plated a noodle-free Taste Alberta family-style meal inspired by flavours, ingredients, and products from across the province. The challenge to the kitchen with every Taste Alberta Prairie on the Plate dinner is to showcase the seven commodities groups within Taste Alberta: Alberta Canola, Egg Farmers of Alberta, Alberta Milk, Alberta Pulse Growers, Alberta Chicken Producers, Alberta Turkey Producers, and Alberta Pork. Well, chef Hanson and his team started off the 2018 Taste Alberta dining series with a bang! The menu represented the many unique voices from the kitchen, with the team sharing a flurry of bites which incorporated each of the commodities groups, and a whole lot more from the bounty of Alberta. Upon arrival, guests were welcomed with a mint raspberry cocktail featuring spirits from two Alberta distilleries: Strathcona Spirits Gin and Eau Claire Distillery Prickly Pear Equinox. I had a chance to savour my drink along with the first bite of the night – a bowl of baby potatoes in a sweet chili created by Jamie Tokuda. It was the calm before the storm as bite after bite arrived at our table, each one from different members of the kitchen. One of the most interesting flavours on the night for me was an antipasto dish finished by Rob Freisen. The bite featured crab apples, picked and brined by Eric Hanson and Ben Staley in 2015 from the Edmonton River Valley, which had been stuffed with jam and wrapped in Alberta pork that Kevin had sourced from a local butcher. I found the crab apples to have an initial flavour of olives, but finished with a distinct sour crab apple flavour. Wrap anything in Alberta pork and you always have my attention. I couldn’t pick just one favourite from the Prairie Noodle Shop Taste Alberta dinner, but one of my top five bites of the evening was a venison tartare with beets and charred onion created by Mai Nguyen. The colours were beautiful and I was left wishing I had another one. So often people think that turkey is for holiday menus, but I loved chef Hanson’s smoked turkey bombs wrapped in Napa cabbage. I’m told the sauce was turkey & chicken broth reduced down before having a smoked chicken fat emulsified in. The dish was an ode to chef Stephen Baidacoff, who showed Hanson the turkey parcel when they opened North 53; Baidacoff was also one of chefs to the create Prairie Noodle’s first four bowls and turn the concept into a series of pop-ups, into reality. Rob Friesen wanted to represent the sun and earth on a prairie road for his beet bite, and to taste our golden fields in a rural area with his dessert. Sadly this gluten-free girl couldn’t have Friesen’s golden beet semifreddo with rye soil and mini beet chips; however, I thought the colour on the beet chips was lovely and my table mates gave the savoury semi-frozen dessert an approving mmm. Chef Hanson’s grilled lamb and celeriac. Another favourite on the night for me was the potato mochi with Sylvan Star Gouda by Kanako Stockdale. I am happy to report that Chef Hanson says these delightful little cheese dumplings will be launching on the new spring menu. If you missed out on the Taste Alberta dinner and want to give them a try, he said these potato mochi will be featured on Feb 13th for Fat Tuesday. In advance of the event, Debra with Alberta Pulse Growers dropped off some product for chef Hanson and his team to experiment with. Kevin Ostapek used the green pea flour to create an onion bajji with spiced yogurt dip and B.C. Merlot dust. As a Celiac, I rarely get to indulge in fried items, so I was thrilled to try this gluten-free dish of Kevin’s that brought back memories of my backpacking trip to India. My sharing tablemates Debra and Simone were kind enough to let me finish off the plate. With the flurry of bites complete, we moved on to the family-style portion of our evening. Our menu included another dish from Kevin highlighting Alberta pulse producers. The smoked pork loin was served atop a red lentil purée and topped with an Alberta Canola mole (a sauce that was one of chef Hanson’s favourite elements on the evening). The pork was fork tender and packed with flavour, and since we were past the by-the-bite portion of the evening, I was able to plate myself a second helping. Chef Hanson’s other favourite of the night was Jamie’s Umeboshi plums he grew and canned over the summer, which he then turned into a sauce with Albertan mustard that he brushed over chicken thighs on the grill. I grew up eating chicken thighs, in contrast to most of my friends who grew up on lean white chicken breasts, so I loved the tender flavour from Jamie’s hand-picked plum chicken dish. The culinary team at Prairie Noodle Shop finished off the Taste Alberta menu with three sweet components. Mai Nguyen presented a malt cake brushed with brown butter drizzled with Alberta honey. I thought the cake looked reminiscint of a dense pound cake, but my tablemates said it was delightfully light and airy. Rob Friesen got creative with Albert Canola by plating a sweet corn ice cream marbled with crunchy toasted canola, served with almond crumble, honey butter and corn ash. And for a special treat, we got to cheers the innovative menu with a taste of Evan’s Cherry Liqueur by chef Eric Hanson. I first met chef Eric Hanson when he was in the kitchen at Niche, so I’ve known for years how talented and passionate the guy is about the food he creates. At Prairie Noodle Shop I am so used to Eric fulfilling my gluten-free ramen cravings that I had forgotten how truly talented he is. 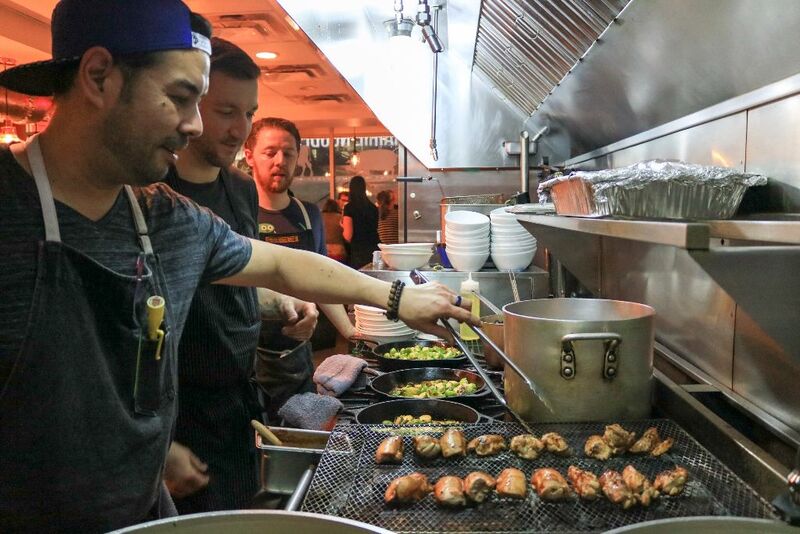 Hanson and the entire team at Prairie Noodle Shop have been so busy as of late it was challenging hammering down a date for a Taste Alberta – Prairie on the Plate dinner. I am so glad that we made it happen – it was one of the most memorable meals I have had in Edmonton in some time. I consider myself lucky to have scored a seat at the sold-out Prairie Noodle Shop table that night. I’d like to thank chef Eric Hanson and the owners of Prairie Noodle House for hosting us, and to the entire team at Prairie Noodle for sharing your passion and your vision for the prairies on the plate. I’m already looking forward to another bite of those Sylvan Star Gouda potato mochis when they land on your spring menu!